As part of the online apologetics and discernment work done here at Apprising Ministries I’ve been showing you the progressive New Downgrade No-Controversy not going on within broader evangelicalism. With it has come a growing syncretism as the Gospel shifts from repentance and forgiveness of sins to let’s all work together to make the world a better place. One such example can be seen in “The Steven Furtick Show” Played At Harvest Bible Chapel Of James MacDonald where we give you an eyewitness report of Furtick being given the pulpit for his Word Faith-lite message at this Reformed church. I’ve told you before that Furtick, who’s 31 and fresh off an appearance for Bill Hybels,  is a Seeker Driven/Purpose Driven pastor, who’s one of the Popes of the Carolinas along with his friend Perry Noble. It’s a documentary about Steven Furtick…oh, yeah, and…Elevation Church, too. I’ve been covering circus church for years now and not easily shocked, but this “blow your own horn” was a bit surprising. Strikes me as a bit premature, not to mention presumptuous, to already be talking about how you change the world. However, it is really quite informative if you wish to understand this SD/PD model. Essentially the prophet-pastor/CEO receives an extra-biblical “revelation” allegedly from God, Who’s said to have given said this man his personal “vision” for what God wants his church to accomplish. Prophet-pastor then “casts the vision” before said church, which binds them to obey him and his personally chosen staff/leadership as they set about to accomplish God’s and the prophet-pastor’s vision. Back to note 1 — http://tiny.cc/6ofsb, accessed 8/16/11. 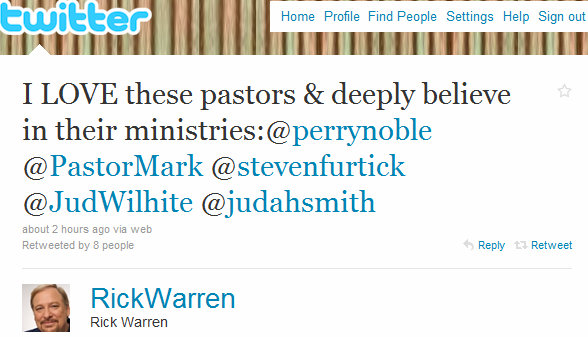 SO DOES PERRY NOBLE NOW THINK STEVEN FURTICK IS A JACKASS? WHAT IF POPES OF THE CAROLINAS LIKE PERRY NOBLE WERE HUMBLE?